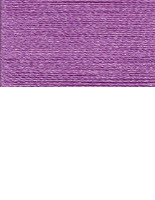 Floriani 100% Polyester Embroidery Thread has a beautiful sheen that is brighter than most rayon�s, and yet it has all the strengths of 100% polyester. It is manufactured with a tinsel strength designed to run smoothly on any machine including high speed commercial embroidery machines. Floriani 40 Weight Polyester Threads are available in 1000m/1100yds Cone and also 5000m/5500yds cones.